The Vermeer CT718 compost turner is efficient and highly productive at turning windrows up to 18 ft. (5.5 m) wide. The compost turner uses a mechanical belt-drive system and a Flexxaire fan that automatically adjusts based on temperature to help maximize performance. The Vermeer CT718 compost turner can now be equipped with full-length steel tracks, an option best suited for rough and muddy ground conditions. 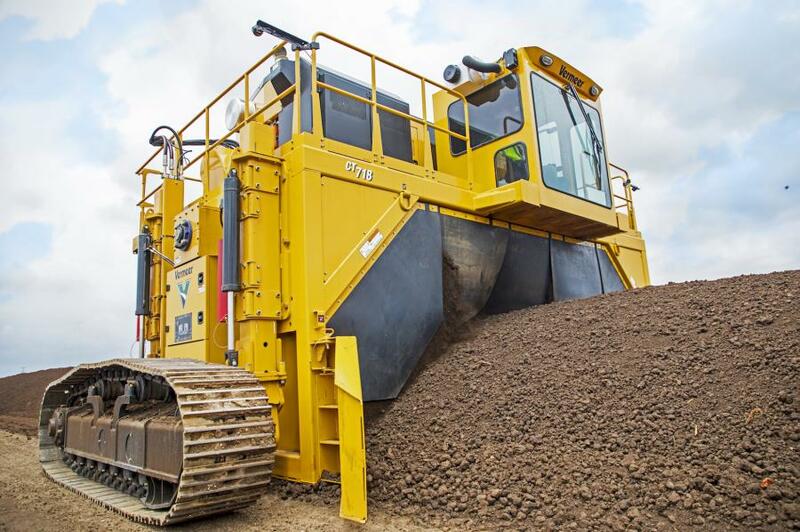 The new full track option is one of four drive systems available for the CT718 compost turner that also include two-wheel drive, four-wheel drive and two-wheel plus two short tracks drive system. The Vermeer CT718 compost turner is efficient and highly productive at turning windrows up to 18 ft. (5.5 m) wide. The compost turner uses a mechanical belt-drive system and a Flexxaire fan that automatically adjusts based on temperature to help maximize performance. An optimized drum design with long flails ensures proper aeration while minimizing material drag and providing protection to the drum skin. The operator-controlled rear curtain also aids with controlling material deflection. The comfortable operator's cab of the CT718 compost turner features programmable, preset controls that allow the user to adjust height with a single touch and a control display that shows the sides and rear of the machine through mounted cameras. Plus, with a low machine height of just 12.5 ft. (3.8 m) and folding ladder, the CT718 compost turner is easy to transport between locations. Additional options for the CT718 compost turner include hard-surface flails and a spray bar attachment. For more information, visit Vermeer.com.